Next in the line of Scottish groups to make it South of the Border, called the Bay City Rollers, this week enter the NME charts at No. 24 with "Keep on dancing". Nobby Clark (singer), Derek Longmuir (drums), Alan Longmuir (bass), Archie Marr (organ), Eric Manclark (rhythm guitar) and Neil Henderson (lead) make up the outfit whose average age is 18, and reports have it, that up in Scotland have been recreating the hysteria that happened in the early '60s. Nobby, Alan and Derek are the only original members left. The group met at school in Edinburgh three and a half years ago, singer Nobby told the MM last week. "At first there was just three of us, but a year and a half ago the others joined, and a year ago we turned professional. We've been doing all around Scotland,in ballrooms and clubs and everywhere that would want us. We actually signed with Bell Records a while ago and it's taken a while to get the first record out." 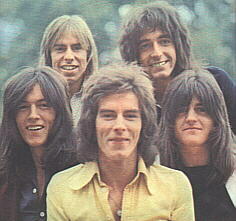 Remark: Because I love you was the first ever self penned Bay City Rollers song that was released on record. The song was written by Nobby Clark. When Shang-A-Lang was released in germany a couple of month after Remember, the cover picture still showed the lineup with Nobby & John, although the song was recorded with Leslie & Woody. On the other hand, Saturday Night/Hey C.B. was rereleased in 1976 with Leslie & Woody in the picture instead of Nobby & John. Nobby Clark is the man who left the Bay City Rollers at precisely the wrong moment. it would appear. He recorded REMEMBER with them, and before it's release decided to quit..... However it happened, Nobby is on his own. The success of the Rollers is assured. They are the ones sitting on a hit single and have another bonny looking lad to take over as lead singer.....His(Leslies) voice has been on the TV tapes the band have done, although it's Nobby singing on the new single REMEMBER. "Nobby left before the single was released," said guitarist and spokesman - in - chief Eric Faulkner. "But we're still friends. He just didn't like being on the road all the time." After two years without so much as a whiff of the British charts (although their single "Manana" did win the Radio Luxembourg's International Grand Prix 1972 and reached number one in Israel), Scotland's Bay City Rollers have seen their current single "Remember" reach an even higher chart placing here at home than "Keep on dancing" managed back in the early '72. With the loss of lead vocalist Nobby Clark this month - "to launch a solo career." - only the Longmuir brothers remain of the lads who recorded "Keep on dancing". Lead vocalist and guitarist Leslie Richard McKeown first threw his lot in with the Rollers some four month ago, just before "Remember" was released an he admits that it's been a problem taking over from the band's established front man. "You've got something to live up to," he explains. "So many Rollers fans find it hard to accept the group without Nobby in front... Although "Remember" was recorded before McKeown took over the vocal honours from Nobby Clark, he recorded all the tapes for TV and radio promotional appearances. He will really come into his own on record in a couple of weeks time, when the follow-up single "Shang-A-Lang" has been sceduled for release. But just how have the fans reacted to Leslie taking over from Nobby Clark as the Rollers lead vocalist ? "When I first replaced him it was a bit difficult," admits Leslie. "Most of Nobby's fans were in Scotland and I've picked up a lot after appearing on Top Of The Pops which has completely abliterated anything that Nobby ever had although I don't mean this unkindly." "He's a great guy," adds Tam Paton. "We wish him all the best."